Volunteer Fireman: public service start & a lifelong association. Charles Godfrey Gunther, who became New York City's 77th mayor, was born near its Maiden Lane and Liberty Street Feb. 7, 1822, two years after his parents had immigrated from Germany. Above are the opening and closing sections of a handwritten Proclamation from Mayor Gunther urging volunteer firemen to obey the law establishing the Metropolitan Fire District, a change both he and they opposed. Below is the full text. Whereas a bill has been passed by the Legislature of this State making certain changes in the Fire Department of this city, and establishing a Metropolitan Fire District, which will doubtless be approved by the Governor and become law. Now, I, C. Godfrey Gunther, Mayor of the City of New York, do hereby earnestly recommend to the members of the Fire Department of this city, and the citizens generally, not to listen to the suggestions which may be made by ill advised or designing individuals, but faithfully to obey the laws of the land and the directions of the officers of the Department, and others in authority, to continue to perform all the duties incumbent on them as members thereof, to abstain from all demonstrations, which may be considered as tending to disorder, to watch over & protect the public property entrusted to their care, and to act in all respects worthy of the dignity & high character of the Firemen of New York. To my former associates & friends I appeal not to tarnish, by any imprudent act, the noble record of the Department but to let its conclusion be marked by the same devotion to law that has attended its past honorable career of usefulness. His father, Christian G. Gunther, a leading fur merchant, sent his first-born son Charles to Moravian Institute in Nazareth, Pa., to get a grounding in German grammar and later to Columbia College grammar school for a command of English as well. As a young man, Charles joined Eagle Hose Company Number 1, thereby launching a lifelong association with volunteer firefighting units and organizations. While a member in active service, he had a reputation for faithfully responding to virtually every call and performing his firefighting duties with dedication and effectiveness. In later years, he held leadership positions in various organizations of volunteer firefighters ("vols"), including chairmanship of the annual firemen's ball. As mayor, he vigorously opposed the 1865 State Legislature's act that mandated a paid Fire Department replace New York City's system of volunteer companies. Aside from legitimate differences over the relative merits of the mandated paid Metropolitan Fire Department (New York City and Brooklyn) versus the then-existing volunteer system, political interests played a major role in the controversy. The volunteer companies often doubled as political clubs, mostly allied with Democrats, especially Tammany Hall. Six other mayors besides Gunther had volunteer fire company ties. Rivalry, political and otherwise, between fire companies sometimes led to clashes at fire scenes, with the "vols" allegedly more intent on fighting each other than fighting the blaze. The rural Republican-controlled Legislature cited such abuses to justify its doing away with the volunteer system. "direct interference with, and usurpation of the rights of the people of this city, who, if they desired a change, have the power in their own hands, through their immediate representatives in the city government, to inaugurate a system similar to that now proposed by the State Legislature." However, since so many in city government owed their election to the volunteer companies campaigning on their behalf, the chances of City Hall inaugurating a paid fire department to replace the vols were less than that of the proverbial snowball surviving one of the city's fires. Over opposition from the city's political leaders and despite the credible performance by volunteer firemen in dealing with the dozens of blazes ignited by the Confederate terrorist agents in the November, 1864 plot to burn down New York, Albany legislators enacted the metro fire district law. Research among Gunther papers in the Municipal Archives reveals, in addition to many duty roll log sheets from his firefighting days, a handwritten version of a proclamation appealing for obedience to the new fire district law. 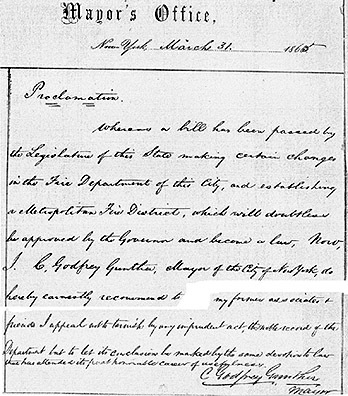 "faithfully to obey the laws of the land and the directions of the officers of the Department, and others in authority, to continue to perform all the duties incumbent on them as members thereof, to abstain from all demonstrations, which may be considered as tending to disorder, to watch over & protect the public property entrusted to their care, and to act in all respects worthy of the dignity & high character of the Firemen of New York. "To my former associates & friends I appeal not to tarnish, by any imprudent act, the noble record of the Department but to let its conclusion be marked by the same devotion to law that has attended its past honorable career of usefulness." In putting aside deep disappointment at the forced demise of the volunteer system and in calling upon vol comrades to see that their system's final hour passes in keeping with its "noble record," Gunther clearly rose to the occasion . . . and perhaps had his own finest hour.